2. State regulators have hired a group of inexperienced people to inspect oil refineries and chemical plants around California, the Chron reports. 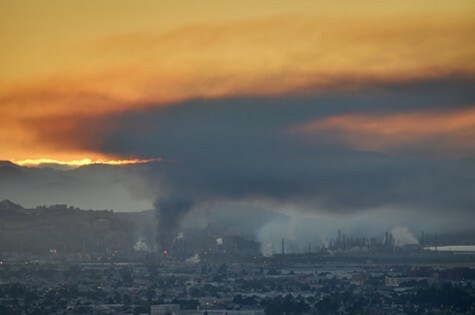 The hiring spree followed revelations in the aftermath of the 2012 Chevron refinery explosion in Richmond that the state only had seven inspectors. The legislature responded by allocating $4.5 million to hire more of them, but Cal OSHA has yet to explain why it decided to hire inspectors with no experience. 3. The Alameda County District Attorney’s Office has charged a candidate for county auditor with six counts of felony voter fraud and perjury for allegedly lying about where she lives, the Bay Area News Group$ reports. Candidate Kathleen Knox claims to live in San Leandro, but prosecutors say she actually lives in Danville in Contra Costa County. 4. San Jose State University kicked out three white students who racially harassed and abused an African-American student last fall, the Mercury News$ reports. The university also extended a fourth student’s suspension for his role in the abuse. 5. And state fire officials have banned outdoor fires in the East Bay — except for camp fires in designated areas — because of extremely dry conditions, the Bay Area News Group$ reports. In addition to Alameda and Contra Costa counties, the state banned outdoor fires in Santa Clara, San Mateo, Santa Cruz, Monterey, and San Benito counties.